Schaffner Press, Inc., 9781936182404, 344pp. The first full-length, authoritative, and detailed story of the iconic actor's life to go beyond the Hollywood scandal-sheet reporting of earlier books, this account offers an appreciation for the man and his acting career and the classic films he starred in, painting a portrait of an individual who took great risks in his acting and career. 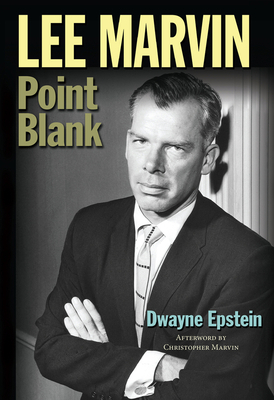 Although Lee Marvin is best known for his icy tough guy roles—such as his chilling titular villain in The ManWho Shot Liberty Valance or the paternal yet brutally realistic platoon leader in The Big Red One—very little is known of his personal life; his family background; his experiences in WWII; his relationship with his father, family, friends, wives; and his ongoing battles with alcoholism, rage, and depression, occasioned by his postwar PTSD. Now, after years of researching and compiling interviews with family members, friends, and colleagues; rare photographs; and illustrative material, Hollywood writer Dwayne Epstein provides a full understanding and appreciation of this acting titan’s place in the Hollywood pantheon in spite of his very real and human struggles. Dwayne Epstein is a freelance journalist and author whose reviews, essays, and articles have appeared in numerous film publications and newspapers, including FilmFax, Outre, and Variety, as well as Bill Krohn's books Serious Pleasures and Hitchcock at Work. He is also the author of several young adult biographies of subjects ranging from Adam Sandler to Hillary Clinton. A lifetime fan and collector of Lee Marvin photos and memorabilia, he has appeared in the A&E Biography episode devoted to Lee Marvin. He lives in Long Beach, California.